Cardinal Vincent Nichols was joined by the Archbishop of Canterbury, Justin Welby, for the closing of the Door of Mercy at Westminster Cathedral on 13 November. 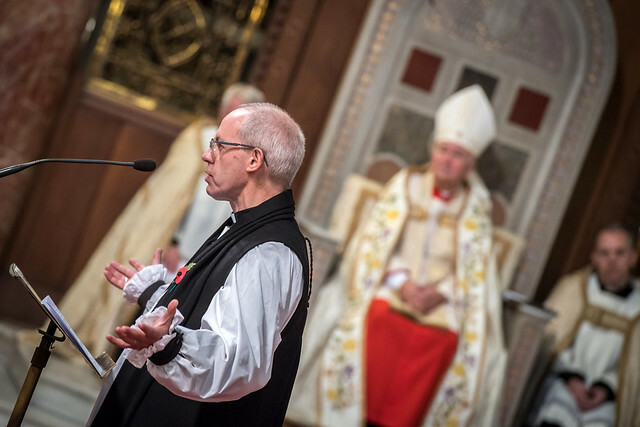 Archbishop Welby preached for the first time in Westminster Cathedral at the service of Vespers. Also present were bishops from England and Wales, members of the Chapter of Canons, and ecumenical guests. In his homily, Archbishop Welby reflected on how the Year of Mercy had "caught the imagination, not only in the Catholic Church, but in all churches and far beyond". "Mercy", he continued, "is the gift that goes on giving... that dissolves the hardness of hearts". Archbishop Welby explained that a Door of Mercy "calls us back to receive mercy by grace and to be people of mercy". Drawing a parallel with the door in the wardrobe of the Narnia series of books, he explained that Doors of Mercy open to us a different world - the Kingdom of God. Cardinal Nichols expressed his joy of welcoming Archbishop Welby to this celebration before they jointly gave the final blessing. The Door of Mercy at Westminster Cathedral was opened by Cardinal Nichols on 13 December 2015 and has remained open throughout the Jubilee Year of Mercy, receiving pilgrims from around the country. The Jubilee Year will conclude on Sunday 20 November when Pope Francis will close the Holy Door at St Peter’s Basilica. Like these images? You can share them from our Flickr photostream. With a simple credit, you can also use these professional photos in your publication, on your blog or share/upload to your website. Our image galleries aim to reflect the prayerful and pastoral work of the Bishops and the life of the Catholic Church in England and Wales. For more of our wide range of images, check out our our excellent Flickr photostream. Our images are available on this Creative Commons license.